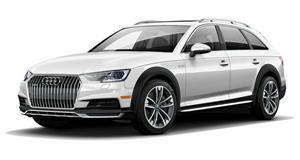 The Audi A4 Allroad Quattro is available with a 252 hp 2.0-liter turbocharged engine mated to a 7-speed dual clutch transmission. All-wheel drive is standard and the increased ride-height, large cargo area and strong performance make for a capable all-rounder. A generous standard specification list includes a power liftgate, leather interior and panoramic sunroof. Notable safety features such as forward collision mitigation and brake assist are also standard while top Prestige trim models come with adaptive cruise control a head-up display and active lane assist.